I want to say it is just up section from that really thick block. Ta-da!!! Howard Allen wins the grand prize. Congratulations, Howard! 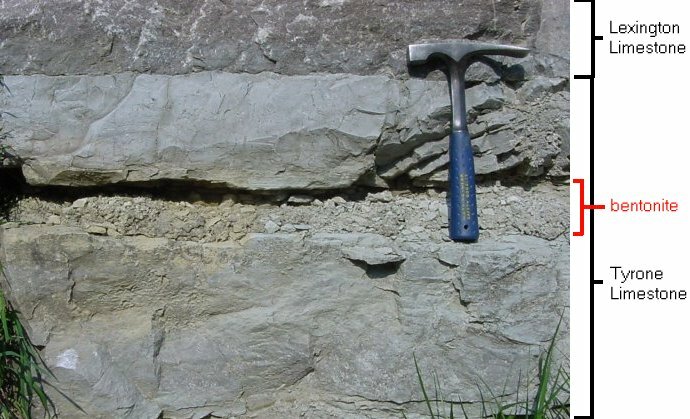 It’s an erosional contact (some portion of the upper New Market was abraded away prior to deposition of the oldest Lincolnshire), and because the layers above and below are more or less parallel, that implies it’s a disconformity of some unknown magnitude. Some amount of time went by between the deposition of the last-surviving New Market and the deposition of the oldest Lincolnshire… but not too much. They are both Ordovician in age. For years, I had misplaced this contact to exactly where Mark, Bob, and Nick guessed it should be – at the switch between massive bedding and thinner, more easily weathered bedding at the top of the massive block. It wasn’t until this spring’s GMU sedimentology field trip that Rick Diecchio was able to set me straight. Now here’s the thing about the GigaPan: I made that image more than four years ago, and the real contact is plainly obvious in it, but I had completely overlooked it (a) while shooting the image and (b) every time I looked at the image on the computer. It’s so, so, so useful to go into the field with people who know what they are talking about. Field time with colleagues is irreplaceable and of infinite value. I look at these strata differently now as a result of going there with Rick. GigaPan images contain data of which the photographers themselves are ignorant. The imagery offers an opportunity for authentic research experiences – chances for students to discover things their professors don’t know about. Thanks to everyone who submitted a guess (or tried to!). Cool – our bentonites show up at the TOP of the Lincolnshire, defining the base of the overlying Edinburg Fm. Ha! Interesting that Bob also picked the same dashed yellow line as I did. In hindsight the disconformity is clear… I guess I put too much weight on the finely-bedded/thickly-bedded general description. But well-spotted by Harold. Thanks for the intro to GigaPan. Speaking of which, wasn’t there originally a link to a long introduction to the local geology and to a GigaPan image that could be maximized to fill the page?